Some of our most precious wildlife are disappearing. Many may be gone in our lifetime! When you think about the plight of the Polar Bears, the Manatees, and the nearly extinct Panamanian Golden Frog — and, if you are like us at Eye Help Animals — you are saddened by this and want to do all that you can to help them and the many other species that are threatened and endangered. If you care as much as we do, then you are doing your share of recycling, buying wood products from reputable places that use sustainably harvested wood to protect the rain forests, and are making ecologically informed decisions that affect your own household as well as your towns and communities. But, sometimes it just doesn’t feel like enough. You want to do more. At Eye Help Animals we're doing more. We know that protecting wildlife habitat is crucial in keeping wildlife safe in the world which is why we support both wildlife conservation and habitat preservation organizations. This is critical if we are to save wildlife in our lifetime and for generations to come. Protecting wildlife and habitat around the world is good for the earth and benefits us in more ways than we can imagine. At Eye Help Animals, we're helping to make a difference by partnering with other organizations who are actively working to save and protect wildlife and habitat — see our list of Special Partners. 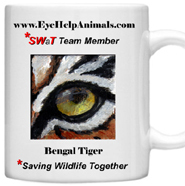 If you agree with us and, like us, want to do all that you can to protect wildlife globally, read Our Mission & Vision, and then join our SWaT Team! Our exclusive SWaT Team Member mug!